Selling UST’s + Hedging Costs ≠ BOND ROUT!!!! Maybe blame the ECB. On June 5, 2014, Europe’s central bank announced a change in monetary policy. Beginning June 11, their deposit account mechanism that acts as a hard floor for European money rates would be set below zero for the first time.  It would mean any funds left on deposit with the ECB in this account would be “paid” -0.10% in interest. In other words, banks would have to pay the ECB for the privilege of holding positive balances here. Europe would get to NIRP first before even Japan. Policymakers there as anywhere never did figure out the contradiction. It was fully expected that NIRP would sufficiently punish recalcitrant banks who were “hoarding” liquidity by piling it up in the deposit account. A minus rate was supposed to motivate them to do something more productive (lend). The flaw, therefore, was in not even bothering to piece together why banks were acting so shy. Penalizing wavering depository institutions wasn’t going accomplish that goal. Determine why they are being shy in the first place, then put together a strategy to deal with this other factor first. It had been one of the more encouraging indications during that time. The cross currency basis of euros against dollars had finally reached zero after an epic journey stretching out over several years. Getting as low as -65 bps during Europe’s 2012 second crisis and recession, the 5-year cross swap registered a plus sign just in time for the ECB’s NIRP. The monetary policy didn’t help Europe’s beleaguered banks, of course, they simply absorbed the costs of monetarily ignorant monetary policies pushing them to face the looming global currency reverse under a higher cost structure. Making them pay more for liquidity wasn’t a particularly wise maneuver as liquidity preferences would suddenly rise often sharply. In any case, it never helps when central bankers panic. If Europe’s economy was recovering and its financial system sailing smoothly along, then why the rushed desire for radically redrawing monetary masochism? No one in the media bothered to ask Mario Draghi, but you can bet that all the big rates and short FX desks were asking themselves that very question and then betting on their own answers to it. By January 2015, the XCurr€ 5s was back again at around -20 bps. 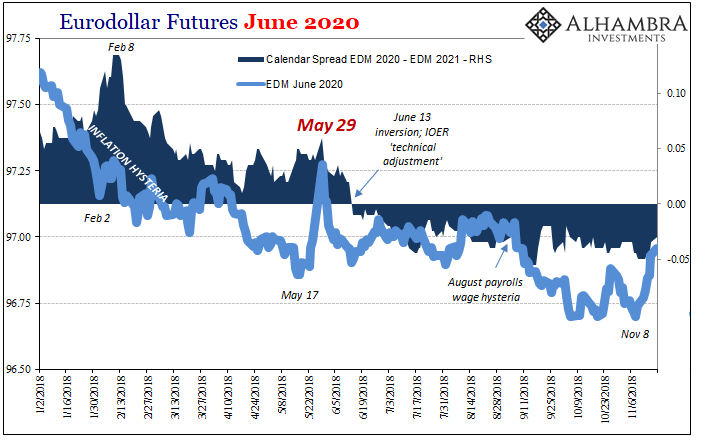 Like credit spreads or US$ interest rate swaps, this esoteric piece of the global eurodollar puzzle would keep moving in the wrong direction for several years while the global economy dropped “unexpectedly” into a major downturn. 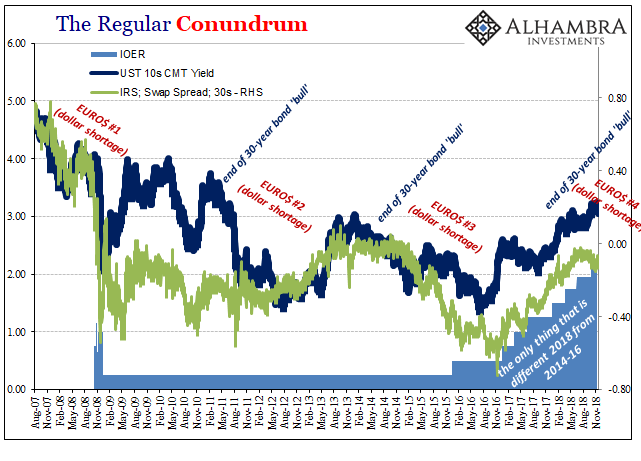 It wasn’t because of NIRP or the ECB’s eventual QE that ultra-low (sovereign, or risk free) interest rates all around the world became ultra-lower. It’s not monetary policy “bond buying” that pushes yields down, rather it’s what is scaring policymakers into bond buying that does. The technicals of a cross currency basis swap almost sound like something outside of reality. I have dollars and want euros or yen. You have euros or yen. I borrow them from you, you borrow the dollars from me. 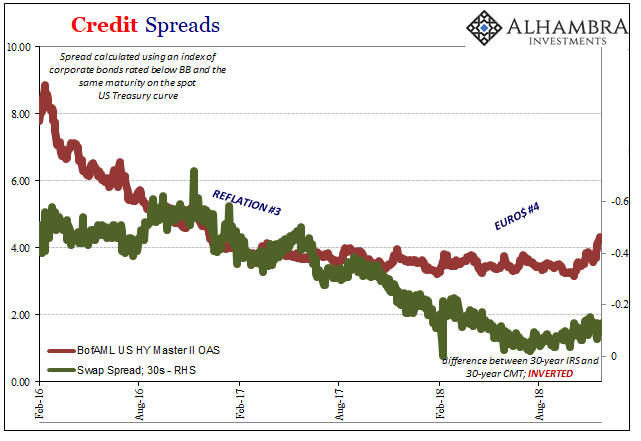 I pay the money rate on euros (Euribor, or TIBOR for yen) plus or minus a spread and you pay the money rate on dollars (LIBOR). The basis, essentially the “price” of the contract, moves around based on all those factors. Except, it really boils down to something very simple and easy to understand. You don’t really have to know anything about the prospects of Euribor versus TIBOR and the outcomes in projected basis gamma to truly appreciate what’s going on in these derivative currency markets. The eurodollar system has made it quite straightforward in practice. A negative XCurr basis says there is high demand for dollars in FX, or alternately not enough supply. As it persists and may even grow worse, as in 2011-12, or 2014-16, that tells us unequivocally it is a systemic dollar shortage. The world requires dollars because it is short them (synthetically). But most people remain blissfully unaware of any of this stuff. 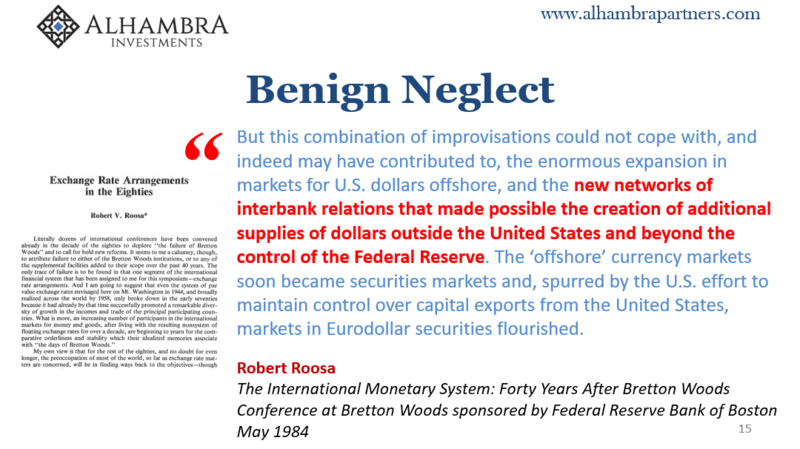 This includes the latest generation of central bankers, unfortunately, who have been operating under a modern doctrine of “benign neglect” that is curiously missing the benign part. Thus, for the few who might be aware of the cross currency basis swap but not its true meaning, a negative basis is “the cost of hedging” for foreigners converting into US$’s. Why do we care in 2018? Yes, the basis is trailing negative again and everyone is looking for the wrong reasons as well as the wrong anticipated results. There is no inflationary scenario here. Dollar funding strains took center stage earlier than normal this year, and if the recent past is any guide, the worst of the squeeze is still to come. Further efforts by banks to shore up their balance sheets are likely to exacerbate a year-end shortage of the U.S. currency in the financial system, according to firms including Bank of America Corp. and TD Securities. That’s even after the three-month cost to convert payments from euros into greenbacks using cross-currency basis swaps swelled in late September by the most since 2009, as market participants sought to preempt what’s now become an annual year-end crunch. Not all yearend funding crunches are the same. Yet, these increased “hedging costs” are supposed to be UST negative, according to some. A mismatch between supply and demand in the Treasury market is likely to keep driving yields higher, DoubleLine Capital’s Jeffrey Gundlach said Tuesday on an investor webcast. Foreign holdings of U.S. government securities have been “shrinking pretty substantially,” the bond manager said, in part because the cost of hedging is making the trade unattractive. The last time foreign holdings of UST’s were “shrinking pretty substantially” was in the same years 2014 to 2016. China sold, according to official figures, nearly $1 trillion in foreign reserves including hundreds of billions in UST’s. During that same period, “hedging costs” rose significantly via cross currency FX. UST yields rose as a result? Of course not. Because it wasn’t hedging nor was it really selling UST’s. 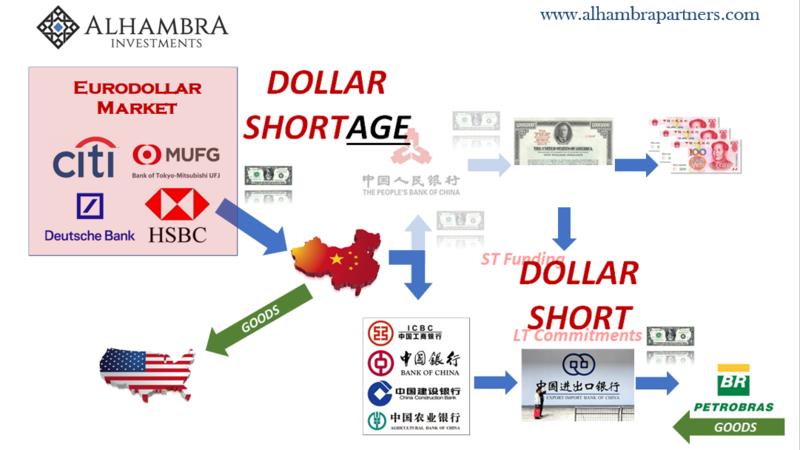 It was a global dollar shortage, another one, which in the end raised liquidity therefore economic risks. The “selling UST’s” was easily offset by, what was it the FOMC said earlier this year, “strong worldwide demand for safe assets.” The two things go together, are inseparable. Dollar shortage is UST positive (price). The only wild card in 2018 is the Fed’s limited influence on the short end. The long end is disagreeing with Jay Powell’s sunshine, unemployment rate optimism; has been for more than a year. There’s enough gathering monetary evidence (and now economic evidence) for a (of a) renewed systemic dollar shortage in 2018 to do so – especially after May 29. 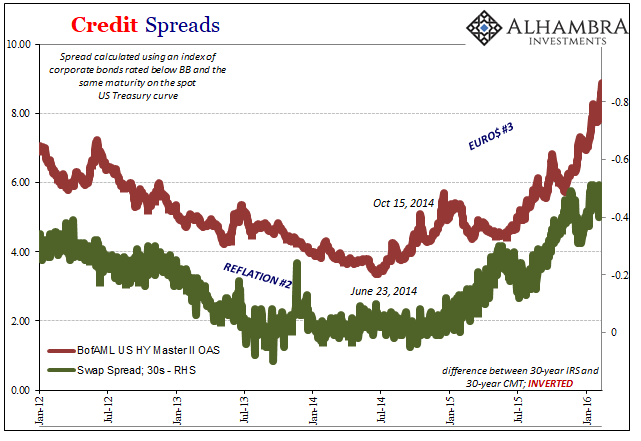 The only question, then, is when these two views break from their current stalemate (flat yield curve). At that point, the yield curve inverts and keeps going, like 2007, or the FOMC realizes its error, like 2008 or 2015 and 2016 (only the one rate hike total rather than one per meeting). 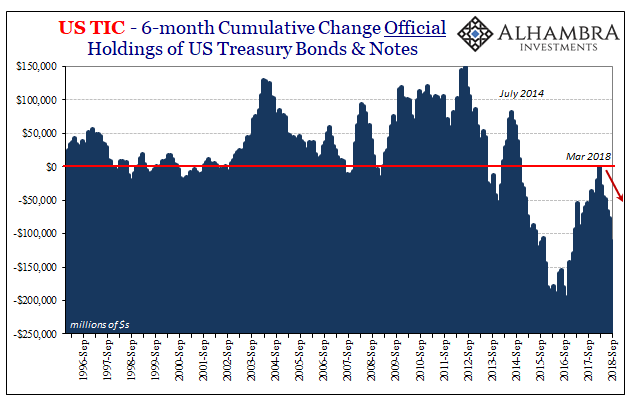 Despite eleven years since the system broke down, actually because of eleven years since the system broke down, liquidity risks and preferences continue to rule everything. Not those perceived by central bankers, nor those extolled by Economists working for these very banks, but in how the banks themselves actually operate in the shadows. Deep in the shadows. At some point, interest rates globally really are going to go much higher. So much higher. As long as dollar shorts and shortages continue to be hitched together, however, it won’t be anytime soon. Dollar shortage equals strong worldwide demand for safe assets, the very stuff of Milton Friedman’s interest rate fallacy. The more foreign governments and institutions sell them because they have to, the greater everyone else will demand them. We’ve seen it three times before already.